How Should I Collect and Ship My Possible Combustible Dust Sample? Items needed to move forward with sample characterization are the Safety Data Sheet (SDS), completed sample test options form, payment information and signed terms & conditions. Please fill out all forms completely to let us know who is sending in the sample and the tests you want completed. There are many times where we have a “mystery sample” because a customer sends us the material, but no other paperwork to know who sent us the sample. This is sure to delay the turnaround on your final results. Safety Data Sheet (SDS) – There are some customers that don’t have an SDS available to send us, but we still need an explanation as to the material’s compositional properties. This information is needed for our lab personnel to know how to handle the material and what personal protective equipment to wear when running tests in our lab. 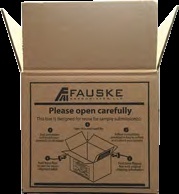 In addition, it is best to send the SDS or explanation of the material with the sample in the event that the package opens during shipment. Sample Test Options Form – The test options form will need to be filled out for each sample submitted for testing. The test options form will serve as a guide for our lab to complete the appropriate testing you want to have run on your sample. The sample name that you provide on the form will be the name that is listed in the final report. Helpful hint: When naming your sample, make it a name that will make sense to you and anyone from your company looking at this report in the future. This extra step will allow your team to review the report at any time and know that the sample was collected from, “Dust collector in mixing room #1.” The bottom line is that you want the sample name to be a useful guide for your team to know where the sample was originally collected. Payment information – We will need a purchase order or credit card information in order to put your sample in our queue. We will not invoice for the testing until the test and report are completed. If your account set up team needs any vendor documents completed, or if you will need our credit card authorization form, let us know at dust@fauske.com or 630-323-8750. We will take care of any of your testing related questions. One final note, any paperwork that you include with the shipment can go into the box. However, please don’t put the forms in with the actual sample. We want to ensure that the paperwork is kept clean and the sample remains as representative as the day you pulled the material from your facility. 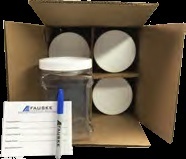 The two items that are needed to be included in a sample shipment are the SDS and Sample Test Options Form. We want to be sure your sample arrives to us in good condition with the appropriate paperwork to get your sample started right away. Because potentially hazardous or combustible dust exists in most manufacturing facilities, a state of the art dust testing lab will frequently receive a number of questions from a variety of industries. Q: Where is the best place to collect material for testing? A: Typically, the finest and driest material present within the facility presents the greatest hazard. With this being said, it is recommended that the material be collected from the dust collector filter, elevated surfaces within the facility, or the dust collector bin. If finer material cannot be collected, and you know that finer material may be generated in the process, it is recommended that you request particle size reduction prior to testing. Q: Can I use historical data to design my dust collector? A: No, it is not recommended to use historical/literature values to design a dust collector or to size explosion protection. Historical values are a good reference to identify if your material has a trend of being explosible and/ or combustible, but there are so many other factors that play a role in ensuring your specific facility has data that truly represents the material within your process. It is important to consider the characteristics such as particle size distribution, particle morphology, and moisture content. Q: How much material do I need to submit for the Explosion Severity Test? A: Typically we recommend that at minimum of 500 g (1 lb) is submitted for the Kst test; however, depending on the density of your material more material may be needed. It is also recommended that additional material be sent if particle size reduction is requested. Q: How long does it take to get results? A: Explosion Severity (Kst) testing is one of the most labor intensive dust testing services we offer. Depending on how the sample behaves during testing, a typical Kst test can take anywhere from 4 to 6 hours. However, depending on the nature of the material and the clean-up involved, testing may take longer. To read more about Kst and Pmax testing, visit this resource.